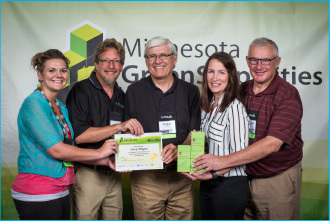 PeopleService partner Arlington, Minnesota achieved a Step Three Award from GreenStep Cities – an organization that recognizes innovation in sustainability and quality of life. Arlington received the award for implementation of 22 measurable performance actions, which represent the community’s outstanding commitment to environmental improvement. PeopleService has partnered with Arlington to provide water and wastewater management services to the city since 2007. Lee Ortloff, lead operator with PeopleService and liaison with Arlington city management, said the award is recognition of the community’s strong energy savings program and best practice efficiencies in water treatment that maintain quality levels. Operator/PeopleService Inc.; Rich Nagel, Mayor; Liza Donabauer, City Administrator and Ben Jaszewski, Council Member.